In general, laparoscopic surgery has some disadvantages on surgical procedure with restricted viewing field and loss of haptic sense. Therefore, preoperative imaging assistance is more important in laparoscopic surgery rather than open surgery. 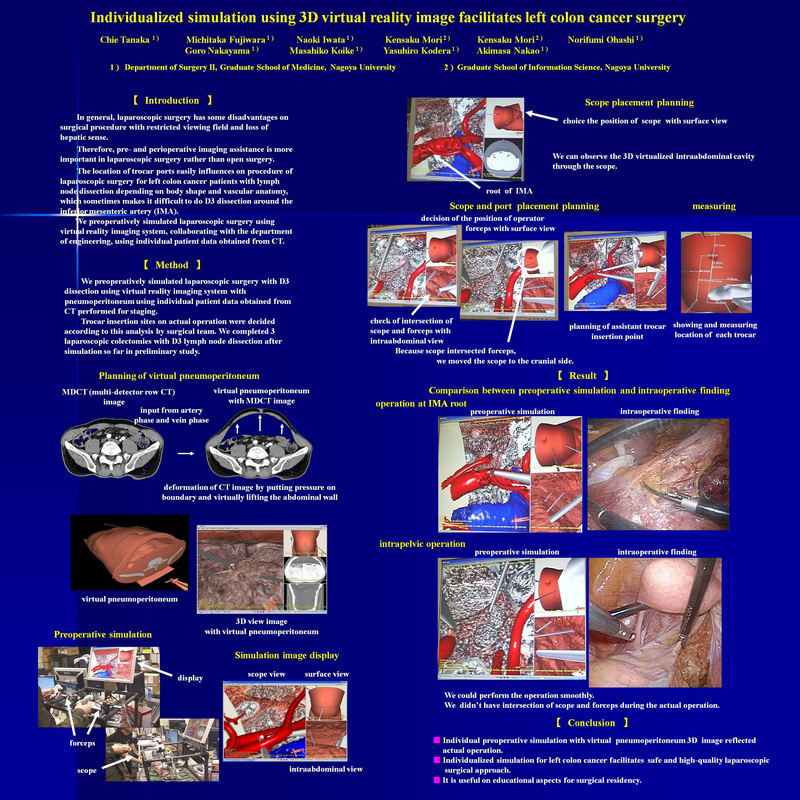 For the purpose of improving evaluation of preoperative images, various approaches were proposed for preoperagtive simulation on laparoscopic surgery. We induced the novel 3D imaging system with multi-detector row CT data for pre-operative simulation in patient with laparoscopic surgery. In addition, we are developing a simulation system with 3D operative view image with virtual pneumoperitoneum. On the other hand, the location of trocar ports easily influences on procedure of laparoscopic surgery for left colon cancer patients with lymph node dissection depending on body shape and vascular anatomy, which sometimes makes it difficult to do D3 dissection around the inferior mesenteric artery. We preoperatively simulated laparoscopic surgery with D3 dissection using virtual reality imaging system with pneumoperitoneum using individual patient data obtained from CT. Trocar insertion sites on actual operation were decided according to this analysis by surgical team. We completed 3 laparoscopic colectomies with D3 lymph node dissection after simulation so far in preliminary study. In our experience, individualized simulation with virtual pneumoperitoneum 3D image facilitates safe and high-quality laparoscopic surgical approach and it is useful on educational aspects for surgical residency. We introduce a novel simulation system with virtual pneumoperitoneum 3D images on laparoscopic surgery. Prospective study is planned in the future.